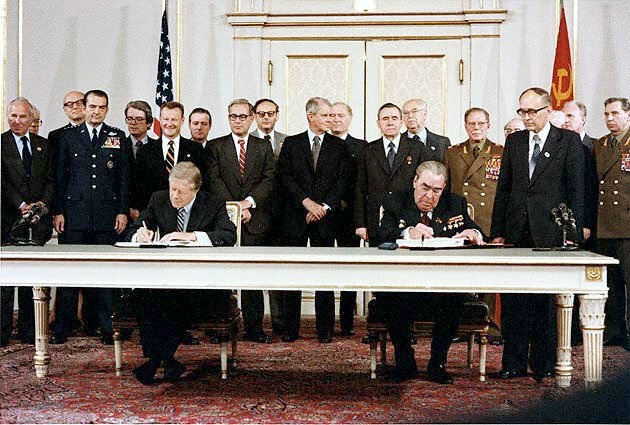 Negotiated between the United States and the Soviet Union as part of the Strategic Arms Limitation Talks, the now-defunct Anti-Ballistic Missile (ABM) Treaty was signed on May 26, 1972 and entered into force on October 3, 1972. The treaty, from which the United States withdrew on June 13, 2002, barred Washington and Moscow from deploying nationwide defenses against strategic ballistic missiles. In the treaty preamble, the two sides asserted that effective limits on anti-missile systems would be a "substantial factor in curbing the race in strategic offensive arms." The treaty originally permitted both countries to deploy two fixed, ground-based defense sites of 100 missile interceptors each. One site could protect the national capital, while the second could be used to guard an intercontinental ballistic missile (ICBM) field. In a protocol signed July 3, 1974, the two sides halved the number of permitted defenses. The Soviet Union opted to keep its existing missile defense system around Moscow, while the United States eventually fielded its 100 permitted missile interceptors to protect an ICBM base near Grand Forks, North Dakota. Moscow's defense still exists, but its effectiveness is questionable. The United States shut down its permitted ABM defense only months after activating it in October 1975 because the financial costs of operating it were considered too high for the little protection it offered. The United States and the Soviet Union negotiated the ABM Treaty as part of an effort to control their arms race in nuclear weapons. The two sides reasoned that limiting defensive systems would reduce the need to build more or new offensive weapons to overcome any defense that the other might deploy. Without effective national defenses, each superpower remained vulnerable, even at reduced or low offensive force holdings, to the other's nuclear weapons, deterring either side from launching an attack first because it faced a potential retaliatory strike that would assure its own destruction. On December 13, 2001, President George W. Bush, who argued that Washington and Moscow no longer needed to base their relationship on their ability to destroy each other, announced that the United States would withdraw from the ABM Treaty, claiming that it prevented U.S. development of defenses against possible terrorist or "rogue-state" ballistic missile attacks. During his presidential campaign, Bush said he would offer amendments on the treaty to Russia and would withdraw the United States from the accord if Russia rejected the proposed changes. However, the Bush administration never proposed amendments to the treaty in its talks with Russia on the subject. Although of "unlimited duration," the treaty permits a state-party to withdraw from the accord if "extraordinary events…have jeopardized its supreme interests." The U.S. withdrawal took effect June 13, 2002 and the treaty is no longer in force.